The project contains 8 work packages (WPs). Each work package has an industrial or academic lead who is responsible for the management and the results of the WP. The work packages are further subdivided in tasks, coordinated by Task leaders. MAGNITUDE is based on an iterative research and innovation process to develop comprehensive solutions. The figure below shows the project structure and the interdependencies of the WPs as well as the partners responsible for them. By clicking on the different WPs you can find out more about their respective objectives and activities. The 7 case studies are described in terms of their technologies and setups. It is assessed which technology couplings can provide the relevant services selected in WP3, in order to support the integration of RES, security of supply and reduction of RES curtailment. Possible technological bottlenecks that can prevent the provision of the targeted services are considered as well. This work is complemented by factsheets of the case study technologies: the flexibility characteristics of each technology coupling is described through quantitative relationships, derived from data collected from the case studies, other projects, and literature review. Then the technological developments needed for the provision of the selected services are evaluated, taking also into account the innovative market designs proposed in WP3. Recommendations are developed on how the technologies and systems should evolve to support the deployment of flexibility products and improved synergies between sectors. Finally the replicability of the services quantified for the cases studies at country level is analysed from a technological point of view and guidelines are issued to describe the opportune development of the infrastructure needed in each country to improve the flexibility options. These results are then valorised in WP7 for the redaction of policy recommendations towards multi-energy systems integration. A methodology combining the commercial and technical perspectives is used to analyse the stakeholders involved in the provision of the relevant services selected in WP3 and their organizational structures. For retained cases, the main roles and their interactions are described as well as related high level, simplified business use cases to maximise flexibility service provision by multi-energy systems to the electricity grid. The outcome of this work is the project desired technical and market functional architectures, nourishing the forthcoming tasks of WP2, WP4, WP5 and WP6 which will later define more precise use cases descriptions, tailored to their specific needs. Then WP2 addresses the necessary level of interoperability and underlying standardized data exchange between multi-energy systems flexibility service providers and commercial and technical stakeholders. In particular, technical specifications are provided for a multi-energy data hub. The outcomes are specifications for the design of standardized interfaces for data management and optimal data exchange between the different actors involved in the flexibility service provision. Finally, an “adaptation layer” is developed providing a light software implementation for the MAGNITUDE multi-energy data hub. These software components are basically data transformers and adapters that will enable the MAGNITUDE multi-energy systems to interact with the surrounding world (aggregators, market operators, flexibility service/ solution providers), while encapsulating the proposed evolution of both communication (IEC61850) and business (OpenADR) oriented protocols. Elaborate and quantify potential business models for the case studies under different market designs. This work package designs business and market mechanisms which enable the full potential value for the European electricity system of flexibility provided by the integration of multi energy systems’ operation. WP3 starts off with a benchmark of the electricity, gas and heat markets in the case study countries (i.e. Spain, Italy, UK, Sweden, Denmark, Austria and France) and the identification of most relevant flexibility services towards the electricity system, reflected in current but also future expected market segments, which can be provided through synergies with heat and gas networks. For promising flexibility and/or energy services, innovative market designs are proposed in a next step, taking into account the coupling between the electricity, heat and gas markets. Based on this analysis, the most promising future multi-energy market design(s) for cross system integration are selected. To be able to evaluate the most promising designs, a multi-energy market simulation tool is built and applied to the different case study countries (as part of WP6), so that the performance of the proposed market designs – which do take into account coupling between the different networks – can be compared to the current de-coupled markets. Finally, based on the outcome of the case study simulation (in WP6), adaptation to the current business models of the different case studies are proposed and a cost-benefit analysis (CBA) is performed for each case study to assess the overall feasibility of the business models from the perspective of the service provider under the proposed market designs. Test and assess new system configurations and market specifications as from WP1 and WP3. 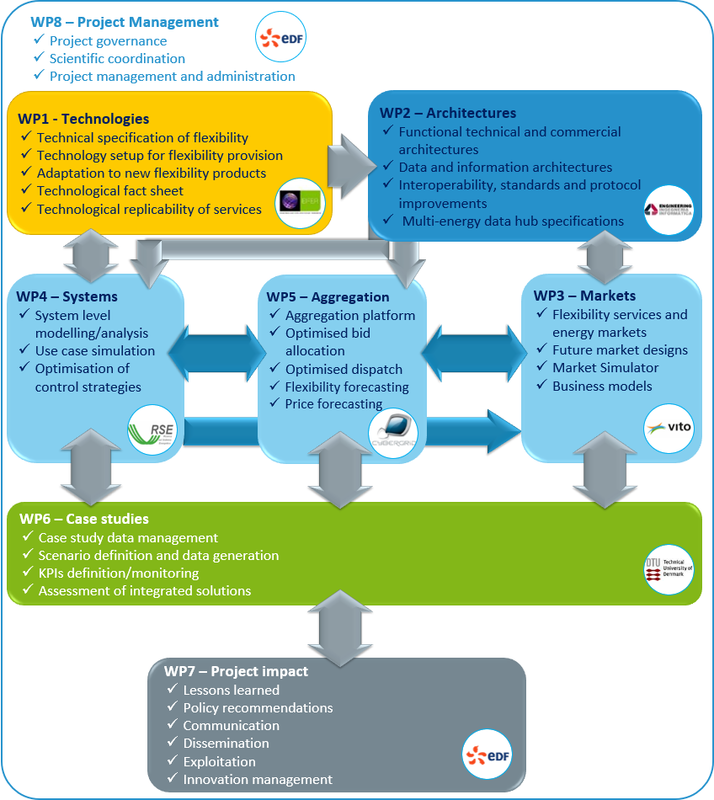 WP4 starts with the definition of the methodological framework and the technical and functional specifications for the modelling, simulation, analysis and optimisation of multi-energy systems, both at technology and system levels. Technical, operational and methodological criteria are provided to guide the development of tools for steady-state, sequential steady-state and dynamic modelling and analysis, focusing on the quantification of flexibility service provision, associated to the suitable time-scale (possibly ranging from seconds, to minutes, hours, up to days). Optimisation criteria based on the KPIs defined in WP6 are also identified, to guide the flexibility provision optimisation of system specific technical use cases. Finally optimisation tools and algorithms are developed to optimize the operation of multi energy systems and networks for the provision of flexibility services to the electricity grid, under cost effective terms and maximising the KPIs from WP6. Both existing technology setups of the case studies and new improved configurations (from WP1) are considered for selected relevant existing markets, as well as innovative market designs (from WP3) and under different scenarios and boundary conditions. Develop novel ICT tools for the aggregation of flexibility services to the power system gained from innovative utilization of synergies between multi energy carrier systems. The primary result will be a multi energy aggregation platform to optimize market revenues from trading these flexibilities on existing and new markets for energy, capacity or ancillary services. Perform joined testing by linking the multi energy aggregation platform to the simulation and optimization tools (developed in WP4) as well as market simulators (developed in WP3) under WP6. Provide simulation results for the business case analysis in WP3. In WP5, the specifications for the MAGNITUDE multi energy aggregation platform and the interfaces to the tools developed in WP3 and WP4 are defined on the basis of results from WP2. This includes the specifications describing the application area of the tools, the aggregation platform, the applicable markets and products, the simulation software architecture and the simulation ICT framework (e.g. simulation objectives, inputs, expected outputs, expected level of complexity, expected performance or scalability). The APIs are also defined for integration between the results from tools and simulators developed in WP4, as well as the procedures of testing and methods of evaluation. a tool to support aggregator’s decision for optimised market allocation, which compares market products and expected revenues with the characteristics and available amount of flexible resources. Based on forecasts for market prices and probability of activation, market rules, and technical restrictions of flexibility providers, new optimization algorithms are developed to find an optimal allocation of bids on several markets, the objective function being the expected net revenue for the aggregator. market price forecasting algorithms for all relevant markets and products (WP3). Efficient forecast methods to quantify and optimize the flexibility provided by synergies among energy networks within various time periods (e.g. hour ahead, day ahead, week ahead) in order to enable the aggregators to participate in various electricity markets. Novel stochastic optimisation-based tools are developed to perform techno-economic studies based on a large number of generated cases, to identify and quantify the boundary conditions of various possible service provision by synergies between energy networks. Algorithms and numerical methods to assess available capacity from given pools of facilities. A versatile technology independent storage assessment tool to facilitate aggregation of related flexibilities, which can handle various types of energy storage applications (e.g. heat or cold) and assess availability and amount of flexibilities (WP4). Development of interfaces and/or APIs for the existing and novel tools for data exchange or for integration with the tools and simulators developed both inside WP5 and in other work packages (WP3, WP4). Integration of all novel tools developed in WP5 with the CYBERGRID’s existing aggregation tools into the multi energy aggregation platform, which will be thoroughly tested by applying predefined test cases. The main goal of WP6 is to evaluate the MAGNITUDE integrated systems based on the case studies. The impact of the proposed designs and the provision of identified services is measured through a selection of KPIs which are developed in the work package. Important indicators can be the RES curtailment reduction, system security, carbon content and cost effectiveness. Apart from that, the work package provides a coherent data foundation from the real case studies which can be used from the other work packages for the technical, market and aggregation simulation activities. More specifically the initial objective of WP6 is the management of the case studies’ data. This is done by centralizing and organizing technical data (such as equipment specifications, capacities), time series (of heat or electricity generation for example) and environmental data. A data base is built and is used not only to provide consistent input data to the project partners but also to integrate output data so to monitor the performance of the MAGNITUDE services and proposed improvements. Following the data management procedures, the base line and future scenarios for the different tool applications are developed. Then, this work package generates future system configurations to illustrate the performance of MAGNITUDE integrated systems when for example a larger penetration of vRES is occurring, or new coupling components are incorporated. All the structural scenarios and configurations are embraced by WP4, WP5 and are further discussed in WP7. Finally, the overall system performance is assessed by linking the market, system and aggregator simulations together in one simulation circle to investigate the combined performance based on the specified KPIs. The simulations are performed under the uniformed set of scenarios created earlier in WP6. Disseminate the project results among the European public and private stakeholder communities. Monitor the MAGNITUDE Advisory Board (MAB) and ensure that its members’ recommendations feed the activities of the project. WP7 has been formed to direct focus of the consortium to dissemination and exploitation of the results during the lifetime of the project and after. A communication and dissemination plan has been prepared to coordinate the publication of results and dissemination related activities. Targeted audience has been identified and includes, but not limited to: energy industry (utilities, distribution system operators, energy suppliers, service providers); EU and national energy regulators and policy makers, standardisation bodies; scientific community; EC H2020 Energy programme, related networks and initiatives, and the general public. For each of them, MAGNITUDE under the lead of WP7 carries out specific targeted activities to maximise the impact of the project results. To support these activities WP7 prepares dissemination material and tools such as project leaflet, presentations and clear visual identity that cater the consortium needs in their different dissemination activities. WP7 also coordinates the activity of the MAB ensuring that it delivers the needed guidance to the consortium members and keeps the research done in the project relevant to the needs outside. WP7, as part of its role, organises events and workshops, together with the MAB members, to expose the results to the targeted audience as described above. Direct outcomes of the project are capitalised under WP7 and lead to the preparation of long term exploitation of the main results. The main outputs from the different project WPs are gathered and organized in order to address major results and findings. This compilation and analysis work enable to conclude on lessons learnt and issue synthetic recommendations from the different activities of MAGNITUDE. Finally, the MAGNITUDE project delivers in WP7 output for policy-makers to feed into the Energy Market Design 2030-2050 discussion. The project results are analysed and translated into tangible policy recommendations (set in Deliverable D7.4) for EU-level, based on a holistic approach, thereby enabling wider renewable energy integration thanks to new services from cross energy carrier systems. WP8 centralises the management aspects of the project, incorporating both technical and project coordination. The coordinator together with an experienced Management Support Team (MST) monitors the daily progress and makes sure that the project work plan is carried out in time and in accordance to the contractual obligations detailed in the Grant Agreement. The Coordinator is responsible to moderate all activities related to strategic and high-level decision making by the MAGNITUDE management bodies and is supported by the MST. This also covers the monitoring of the constantly evolving state of the art, analysis of the project progress in light of such evolution and proposal of required adaptations in light of such findings, as well as coordination of partners’ activities to optimise collaborative work and use of resources. Last WP8 includes the set up and activity of the Innovation Management Team that manages the Intellectual Property of MAGNITUDE results, in accordance with the MAGNITUDE Consortium Agreement. WP8 also includes the adaptation and implementation of the strategy for IP portfolio, for patenting and for publications. WP8 manages the possible evolutions of the Consortium Agreement in case of need, and the market watch. WP8 thus has great influence on the project’s exploitation strategy and plan developed in WP7.